This Garage Floor Grinding post is sponsored by The Home Depot. I have been compensated for my time and provided with product. All ideas and opinions are my own. This post contains some affiliate links for your convenience. Click here to read my full disclosure policy. Slowly I have been chipping away at taking my garage from a total disaster to a ‘hopefully’ useful garage and workshop space. Ever since the day we bought this house, my husband has been saying we should epoxy the garage floor. I himmed and hawwed about it. Knowing it would be a lot of work (and that I’d be doing the work since it’s my junk in the garage.) I also wanted to paint the garage walls and ceiling before epoxying the floor. In hopes of using a nice big dust mop to help sawdust clean up go faster, I decided to start working on it. Last spring I moved all of my junk to 1/3rd of my garage space and painted the walls and ceiling and applied RockSolid Silver Bullet to 2/3rd of the garage. Can you even believe it’s the same garage? Ya me neither. I love it, and yes I’m sure I heard an ‘I told you so’. What about the other 1/3rd of the garage?..well…here’s my excuse. The culprit is the end of the garage pad, it actually slopes up, funneling the water into the garage, instead of away from it. Plus we may have a little dip in the garage floor where the garage door pad isn’t snug on the concrete. You can see on this bubble level that the cement slopes towards the garage. 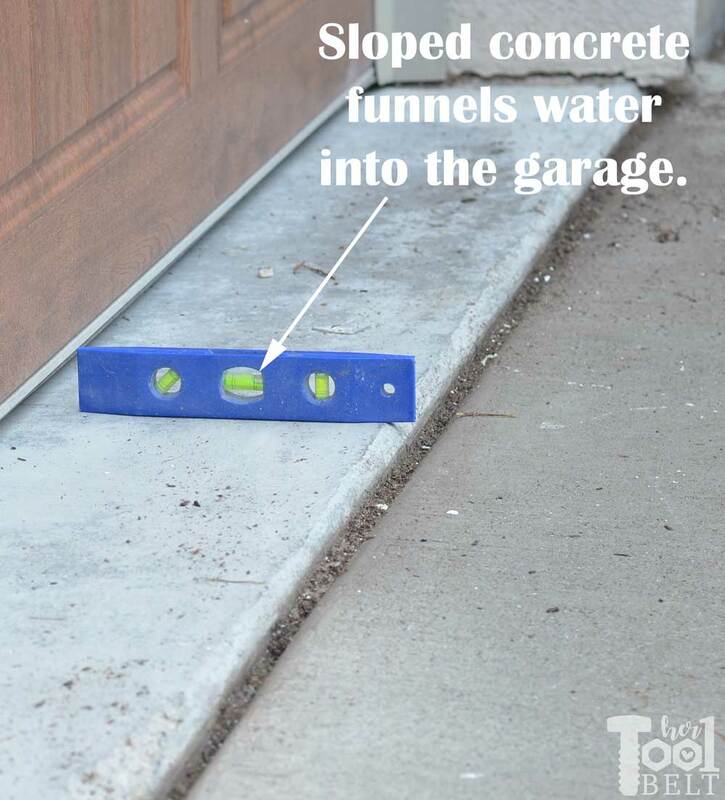 The water leaks in the garage, only where the cement is sloped towards the door. 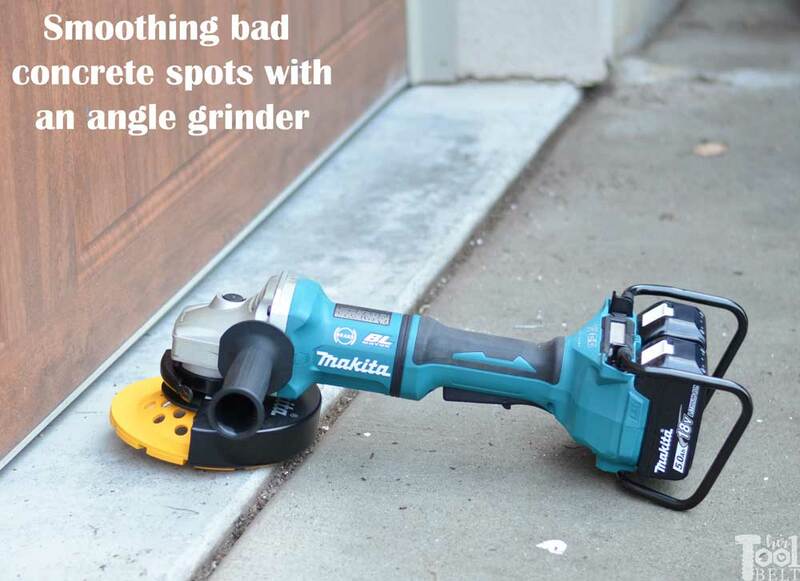 Lucky for me, one of the tools that I get to review for the Home Depot prospective program is Makita’s 36V (18V+18V) brushless 7″ cordless angle grinder (XAG12). To make a cordless power tools comparable to the larger corded model, Makita has developed 36v tools that use two 18v batteries in series (18v+18v = 36v). 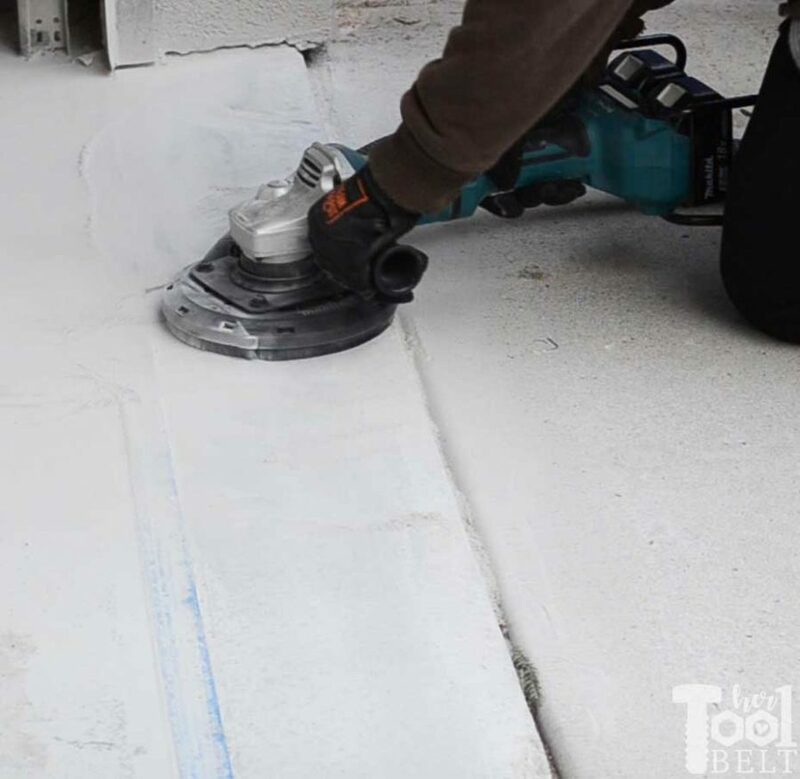 This technology is awesome because you don’t have to invest in a different battery platform if you’re already running the Makita 18v power tools. I bought a 7″ Diamond Cup Grinding Wheel to attach to the 7″ angle grinder. 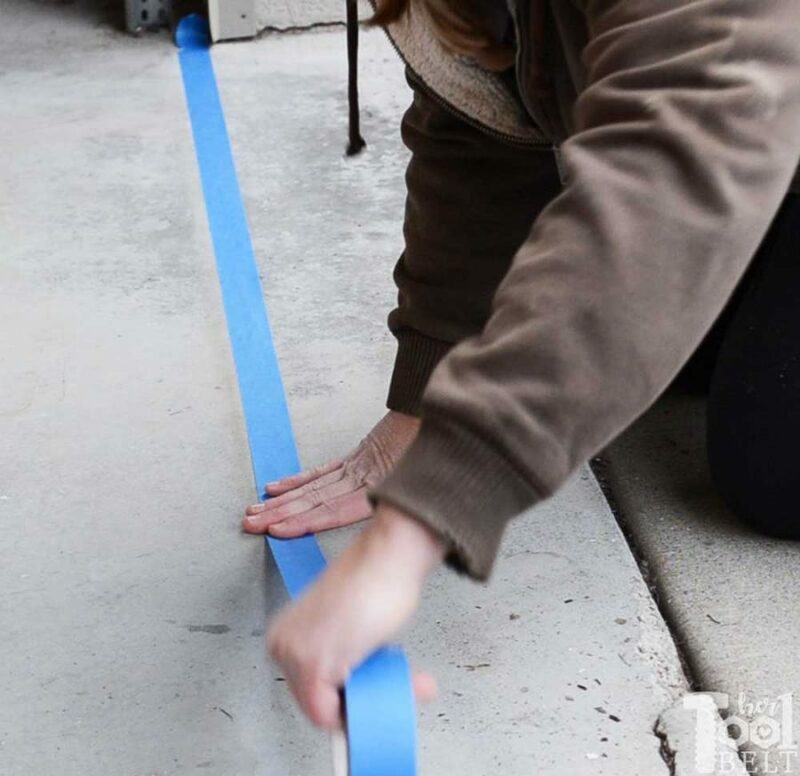 Before I started grinding the cement, I set up a tape guide line so I didn’t accidentally grind underneath where the door shuts. For PPE I grabbed gloves, safety glasses, dust mask and hearing protection (it is a loud process). Then I went to town on the concrete. I started by trying to reduce the height of the highest lip of the concrete. From there, blending in towards the tape line. I always needed to keep a nice sweeping motion or I’d get big dwell marks if I stopped. With the 7″ angle grinder being so powerful I was worried about how it would handle. It was actually really smooth and easy to use and maneuver around. You can move the front handle to either side of the angle grinder. There isn’t a trigger lock, I’m sure for safety reasons. The let down when the batteries ran out of juice was nice and smooth. I did find that having the diamond cup open was creating a ton of dust! To help reduce the amount of dust I went and bought a grinder dust shroudand hooked it up with my shop vac. The vacuum and the shroud didn’t contain all of the dust, especially on the angled grinds. It did a better job on the more flat areas. One thing the shroud did was direct a lot of the dust on the ground instead of in the air, which was really nice. I really like using cordless tools because I only have a few plugs in the garage and hate routing around extension cords. So how did the batteries hold up on a high power situation? 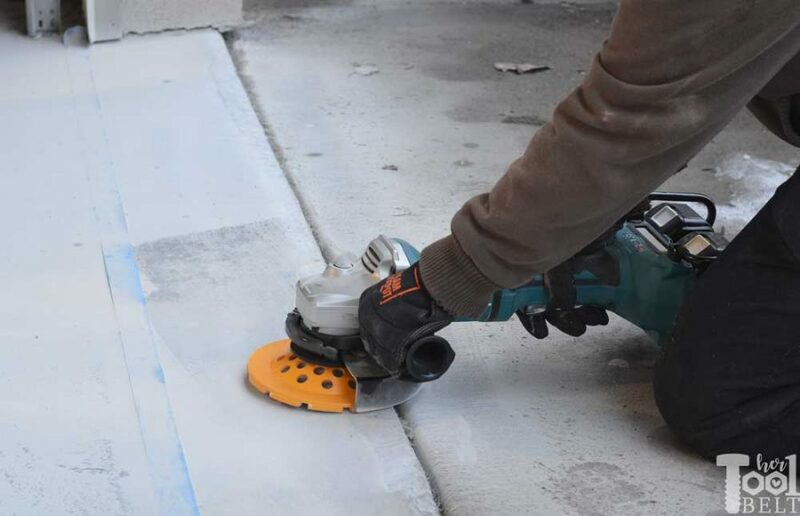 Using 2 18v 5ah batteries, I could grind the concrete for 8 1/2 minutes consecutively. I could grind quite a bit of concrete in 8 1/2 minutes. The 5ah batteries take about 45-50 minutes to charge, they are pretty quick for that size. Now I don’t have any excuses to start working on that other 1/3rd of the garage! This is the coolest post! 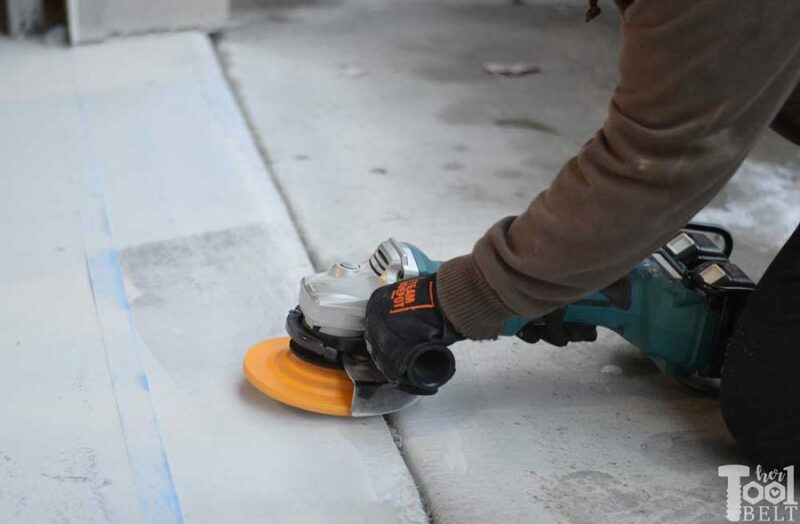 I had no idea we could grind down concrete when there are slopes etc. So cool! That’s a great improvement! Gonna have to get me one!